Food security in Iraq has improved in the last decade, as the American-led invasion brought an end to sanctions and a resumption of open relations between Iraq and the rest of the world. Historically, Iraq’s vulnerability to food insecurity has been largely due to barriers to international trade - caused by two decades of wars and sanctions - which hindered the export of oil and import of food commodities. These barriers also affected Iraq’s ability to modernize the agricultural sector and employ new technologies; local production could not meet the country’s growing food needs. As such, even during the worst years of sectarian violence in the last decade, access to food improved on average, compared to the years under sanctions. But when the UN leveled sanctions against Iraq in August 1990, and US government credits for agricultural exports to Iraq ceased, Iraq - almost completely dependent on imports for its food needs - saw food deprivation rise to 15 percent by 1996, according to FAO. 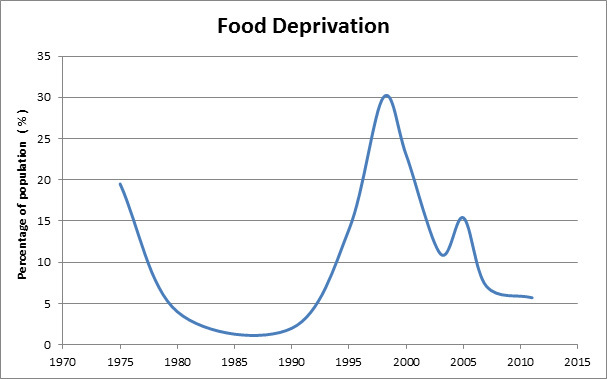 Throughout the 1990s, food deprivation continued to climb, reaching a peak of close to one-third of the population in the late 90s, by some counts. Humanitarian food supplies delivered through the UN’s Oil-for-Food Programme, initiated in 1995, helped ease the strain, but during the early to mid-2000s, the Public Distribution System (PDS) - the government’s subsidy scheme created in 1991 - remained “by far the single most important food source in the diet” for the poor and food insecure population, according to a 2006 report by the government and the World Food Programme (WFP). While the terms “food insecurity” and “food deprivation” are often used interchangeably, they use different methods to measure the same thing: Food security is usually measured by the frequency and cost of people’s eating habits (the 2003 and 2005 surveys, for example, looked at the amount of money families were spending on food), while food deprivation is measured in terms of how many kilocalories a person consumes a day. 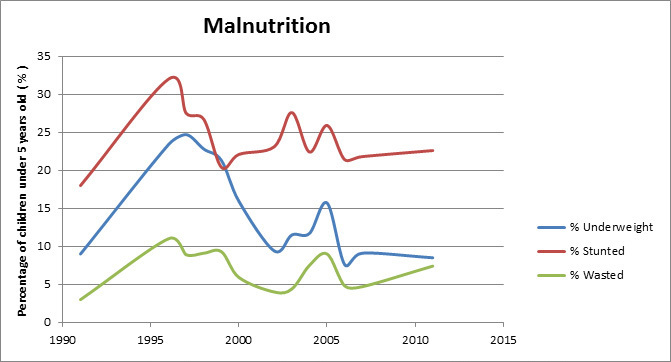 Malnutrition indicators paint a blurrier picture. Note: This graph combines statistics from different sources using different methodologies that cannot necessarily be compared. It reflects only a general outlook, not specific trends. The percentage of children under five who are moderately or severely stunted (too short for their age) or wasted (underweight for their height) both increased - if only slightly - over the same period, a “worrying” trend, aid workers said, given the long-term impacts of malnutrition on mental development. Here, too, there has been change. While in 2007, insecurity had a huge bearing on food security, the food insecure today are traditionally vulnerable groups - the illiterate, the unemployed, the displaced and female-headed households. For more, check out this UN fact-sheet on food security and this presentation by UNICEF comparing the child indicators in Iraq over the last three to five decades. The bulk of statistics come from WFP/government surveys in 2003, 2005 and 2007; and UNICEF/government surveys in 2000, 2006 and 2011. This 2010 report on food deprivation analyzes 2007 data collected in a survey by the government and the World Bank, just as this 2012 report analyzes food security data from the 2011 IKN survey. The FAO has its own figures on food deprivation. The government has also tracked statistics on underweight children from 1991 through 2009.